According to the US Department of Labor, it’s possible that Labor Day began with one Peter J. McGuire, leader of the Brotherhood of Carpenters, who advocated a day to honor workers “who from rude nature have delved and carved all the grandeur we behold.” The same might be said of artists. This Labor Day, you can visit LACMA for free and, while you’re here, see images of workers through the ages. Winslow Homer, The Cotton Pickers, 1876. Winslow Homer’s Cotton Pickers (1876) depicts women working in a cotton field, silhouetted against the sky. 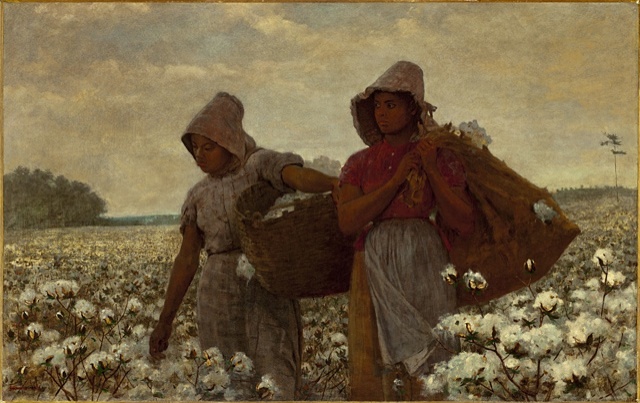 He painted them at a tenuous moment in American history, as African Americans struggled to claim the right to control their own labor where slavery had recently flourished. Homer depicts the two women as monumental and majestic, the figure on the right looking into the distance with a resolute expression. It’s a powerful portrait of labor and determination. From the Spanish colonial period, we get The Twelve Months of the Year, hanging in our Latin American galleries. 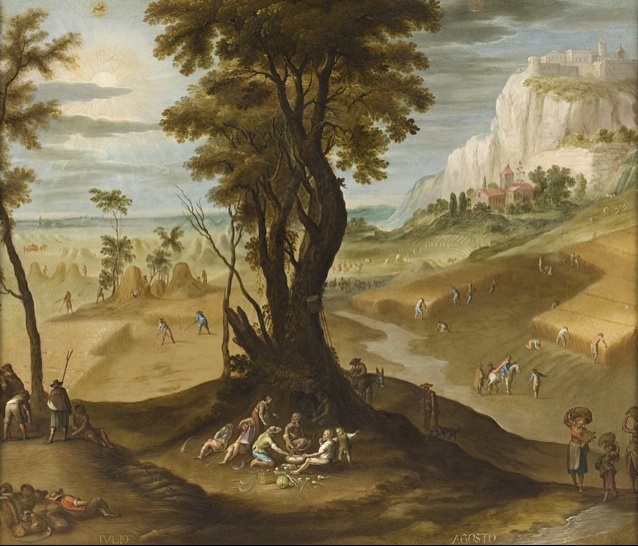 Painted in the latter half of the seventeenth century, the series depicts all sorts of seasonal work, and serves as a reminder that work was once tied more to the weather than to a job description. Each painting depicts two months, indicated in Spanish. The scene showing July and August shows farmers working in fields of golden wheat, surrounded by people lunching and kicking back on the grass. September/October,which hangs just next to it in the gallery, invites a post-Labor Day autumnal mood. Is working out really working? 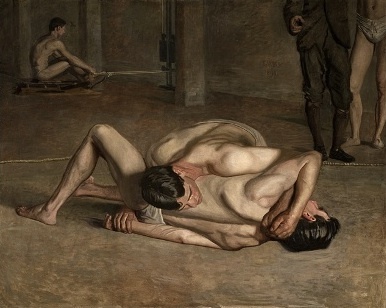 If so, don’t miss the dual exhibitions Manly Pursuits: The Sporting Images of Thomas Eakins, side-by-side with Catherine Opie’s Figure and Landscape. Rowing, boxing, swimming, wrestling, sailing, hunting, and football-ing…there’s plenty here to wear you out, and much that serves as a metaphor for the trials of other kinds of work. And if you want to see the fruits of LACMA’s current labors, peek into the Resnick Pavilion, which opens in just a few weeks. 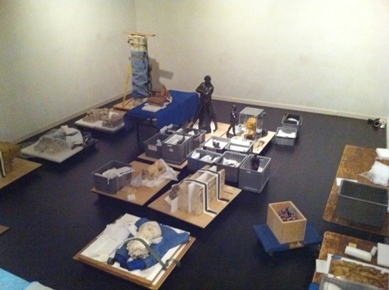 Curators, conservators, guards, electricians, and carpenters are all hard at work assembling upcoming exhibitions. As you may know, we have been spending the last few months reinstalling our European collection on the third floor of the Ahmanson Building. Many of the galleries are already open, with a few more still to come. 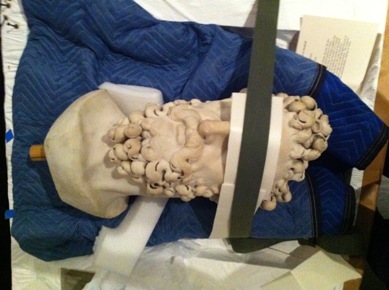 Last week designer Michael Storc snapped a couple pics of the installation continuing apace. We’ll let you know once the reinstallation is fully complete. If you’ve read Barry Gifford’s novel Wild at Heart, or seen the film version directed by David Lynch, then you’ve met the characters Sailor Ripley and Lula Pace Fortune. Today, as part of our Cell Phone Stories project, Sailor and Lula visit LACMA. Gifford, who recently published Sailor and Lula: The Complete Novels, has set his characters loose here at the museum, where they’ve come upon Andy Warhol’s Black and White Disaster. Read the story here. You can see Black and White Disaster if you come to the museum; it’s on view on the third floor of BCAM, along with a handful of other Warhols and works by Jeff Koons. Head up after you’ve taken in John Baldessari: Pure Beauty, which is nearing the end of its run. If you’re an L.A. County resident, you can see the Baldessari show, the permanent collection, and all the other galleries for free after 5 pm tonight. While you’re here you can catch the Philippine-born vocalist Mon David performing for free as part of Jazz at LACMA. You can hear some samples of David’s music at his website. This weekend we have two more free concerts in addition to tonight’s jazz: tomorrow, Oscar Hernandez and the LA/NY Connection will take the stage as part of our Latin Sounds series —ending next weekend!—and on Sunday pianist Maria Demina and violinist Mitchell Newman will perform works by Chopin and Respighi for the Sundays Live series. Lois Lane: Superman! You’ve arrived just in time! Lois Lane: The dastardly villains have made off that way, toward Fairfax! Lois Lane: They’re getting away! Maybe you should fly, or use your super speed? Superman: You be the reporter, I’ll be the superhero, okay? Lois Lane: Or just run at a normal pace? 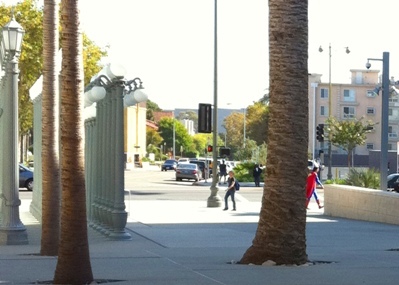 Superman: Really kind of enjoying my walk right now, Lois. I’m actually here to see the Baldessari show. Lois Lane: But the criminals! Lois Lane: But, my purse! They stole my purse! Superman: Maybe you could just call the cops? 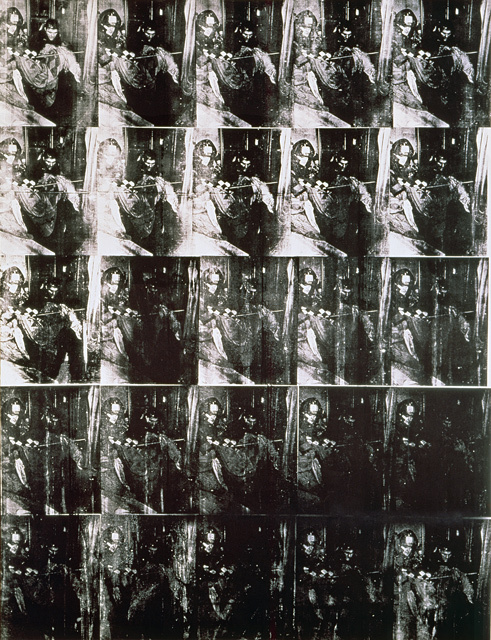 This is a long-overdue exhibition for an icon of conceptual art. Lois Lane: Sometimes you can be so difficult! Superman: I just want some “me” time. Did you miss Saturday’s Muse til Midnight? If so, you also missed mustaches. There lots of mustachioed gentlemen (and ladies!) roaming the event. Here were some of our favorites, courtesy photographer Jonathan Ikemura. Lots of stuff happening this weekend, and I’ll get to that in a moment. But first let’s talk about Muse ‘til Midnight, and all the fun you’re going to have there on Saturday night. There’s going to be an open bar. There’s going to be a mustache contest. There’s going to be vaudeville performers wandering the campus. There’s going to be admission to the Thomas Eakins and Catherine Opie exhibitions. Did I mention the mustache contest? There’s going to be DJs by the names of Fangz and Pumpkin. There’s going to be a band called the Unextraordinary Gentlemen, comprised of bass, violin, drum machine, and singer, which needs to be seen. There’s going to be people dressed like they’re from the nineteenth century. And there is another band called Dusty Rhodes and the River Band—and if you watch this video for their song “All One,” and you still don’t think you’re going to have fun, then you and I just have a different idea about what fun is. Don’t let Dusty win the mustache contest. More info here. In the event you do have different ideas about fun, perhaps some of the other events we have this weekend will suit you. 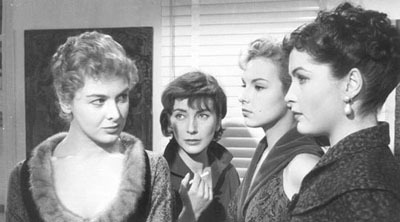 How about a brand new 35mm print of Michelangelo Antonioni’s Le Amiche? This is a newly restored print of an early landmark in the great director’s oeuvre. We’re screening it five times this weekend—twice tonight, three times tomorrow. Then it’s gone. Saturday afternoon we have a special presentation on Buddhist Sutra painting with artist Oegil Kim Kyeong Ho. This traditional technique flourished in Korea during the Goryeo period (918–1392) but has become something of a lost art since the advent of the printing press. Oegil Kim Kyeong Ho will give a lecture (in Korean, with English translation) at 2 pm, followed by an actual painting demonstration in the Boone Children’s Gallery—right outside the Korean art galleries—at 4pm. Both events are free. It being summer, we’ve got a free concert every night of the week. 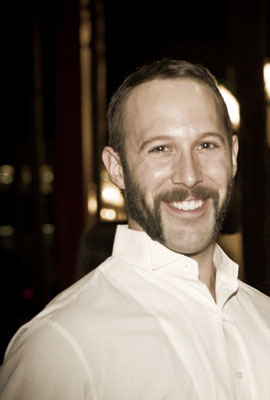 Tonight, the Bobby Bradford Mo’tet will hit the BP Grand Entrance for Jazz at LACMA. 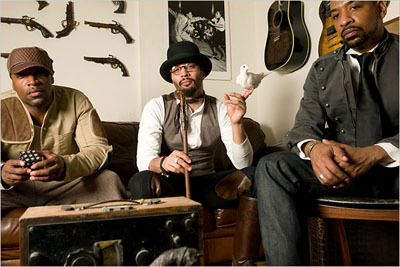 Bradford has played with greats like Ornette Coleman, Eric Dolphy, and Charlie Haden, so this is not to be missed. For this performance he’ll be joined by artist George Herms, one of the icons of assemblage art in L.A. alongside Ed Kienholz and Betye Saar. How exactly they’ll collaborate, I’m not sure, but it’s sure to be worth a look. Before you hit Muse ‘til Midnight on Saturday, come early and check out Alfredo de la Fe in Hancock Park as part of Latin Sounds. Violin may not be the first instrument you think of when you think salsa, but after watching de la Fe, it will be. Finally, Sunday in the Bing Theater sees pianist Andreas Klein performing works by Mozart and Brahms, also free. 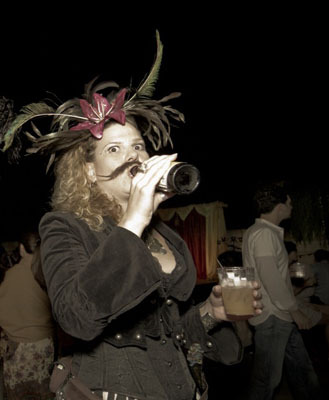 This Saturday LACMA Muse is holding its annual Muse ‘til Midnight event, which will include live music, open bar, a mustache contest (you heard me), and viewings of Manly Pursuits and Catherine Opie. Taking its inspiration from the Eakins exhibition, the theme of the night is a throwback to an earlier, more industrial age. 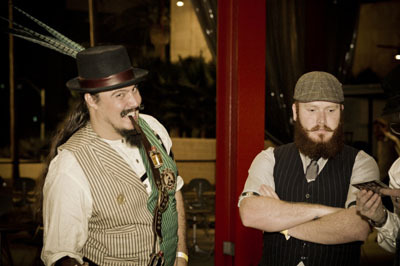 That’s why many of us on the Muse team were outfitted in Steampunk attire by the clothiers at Clockwork Couture. 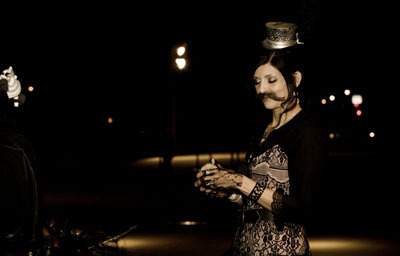 We talked to Clockwork’s Captain Donna Ricci to give us (and you) some pointers on making the perfect Steampunk outfit. Can you describe the inspiration for the Steampunk aesthetic? To say that Steampunk “Damns the factory but celebrates the machine” is one of the most accurate quotes stemming from the budding subculture. Inspiration for the look comes from the working-class Victorian: not fine lords and ladies but rather ship captains, yard bosses, storekeeps, metal smiths, dressmakers—and with that comes a more practical ensemble. Something about that working-class angle comes across in the colors of a lot of Steampunk outfits—they’re not wildly colorful. 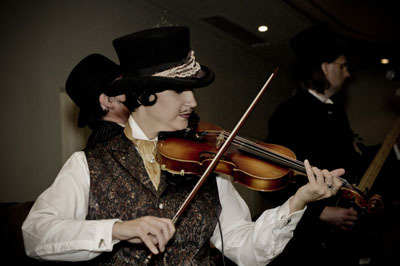 Because many period images were in sepia, many Steampunks have fancied themselves in browns and blacks. Partner that with the working-class appreciation, and they tend to shun the acid dyes of the Victorians. This is not to say it’s not allowed, just know with Steampunk, brown is the new black. How would one go about creating the Steampunk look? 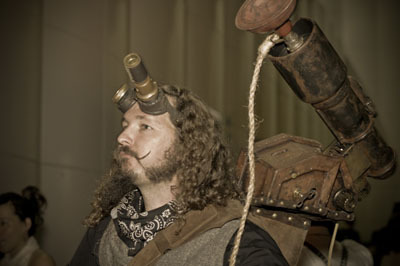 Creating a Steampunk ensemble requires imagination, ingenuity, and creativity. Thrift stores can be a great source to find sacrificial items to be altered. Many a prom dress was reinvented into a Victorian Steampunk gown. Do a little research before going in so you can keep an eye out for what makes sense. For ladies, you can never go wrong with a swag-front bustled skirt, ruffle-front blouse, granny boots, and great little hat. Do remember your foundation when dressing, utilizing a corset to get the hourglass silhouette of the time. An underbust corset helps create that look while giving you more “breathing room.” Literally. For men, a true gent can never be without coat and tails and a proper topper. A pair of dress slacks and shirt will go well under a well tailored frock coat or tuxedo jacket. A bowler or top hat complete a dapper look. 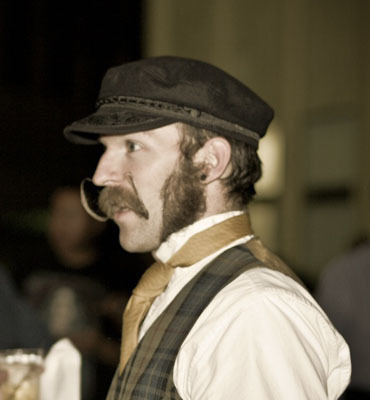 Spectacles or a dangling monocle distinguish a literary man from the uneducated worker and an cravat or ascot can cover up an unsightly or non-period button-up shirt. Don’t be afraid to show some frill. The Victorian gent was the first metrosexual. It seems like a lot of the Steampunk look is in the accessories. A Steamer can never go wrong if he knows where his goggles are. It’s much like a passport—you should have a pair because you just never know what adventure awaits you today. Flights on dirigibles were as common as train rides in our alternate history, and one really does not fancy a bug in the eye. You are currently browsing the Unframed The LACMA Blog blog archives for August, 2010.